Frontenac enroute pour Cataraquie. John Henry de Rinzy. Bibliotheque et Archives Canada. 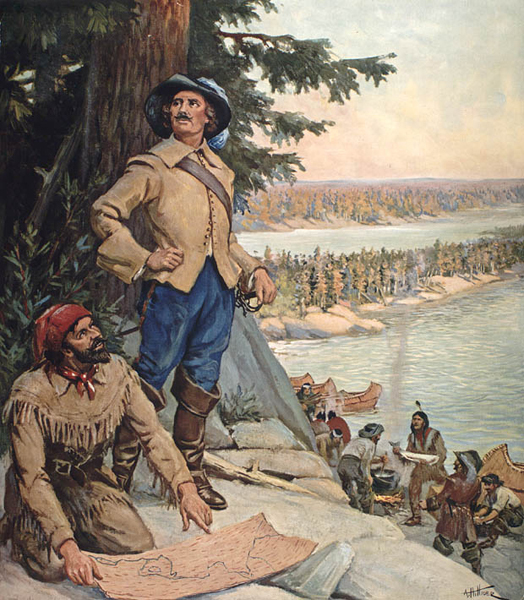 Exploring the history of colonial North America, I have come across many images of voyageurs, coureur des bois, French Canadians, Metis, and Indians. 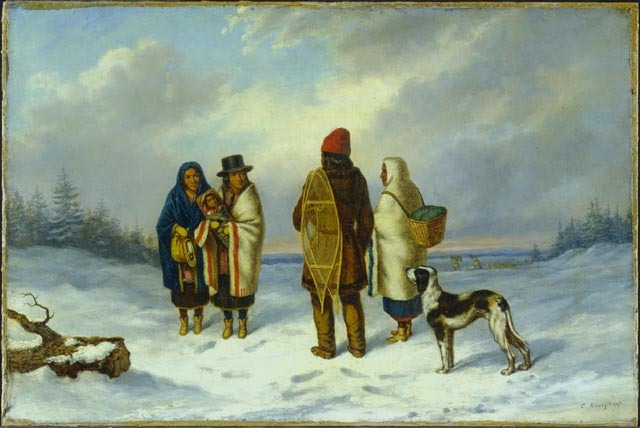 Many of these images are paintings by European artists who traveled and resided in North America in the 17th, 18th, and 19th centuries, encountering the frontier population on their journeys. 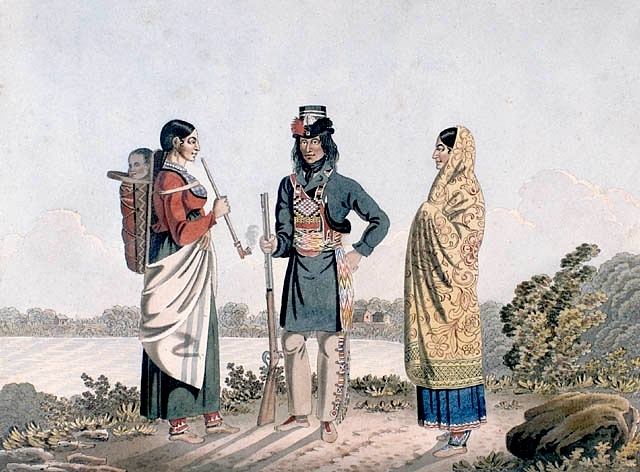 Metis man with two spouses. Peter Rindisbacher, 1825-26. Bibliothèque et Archives Canada. Indien et Habitant. Artist unknown, 1838. Bibliothèque et Archives Canada. Indian Wigwam in Lower Canada. Cornelius Krieghoff, 1848. National Gallery of Canada. Voyageurs at Dawn. Frances Anne Hopkins. Bibliotheque et Archives Canada. L’etoffe du pays. Henri Julien. Musée national des beaux-arts du Québec. French Canadian Trapper. Artist “VC” unknown, circa 1857. Bibliotheque et Archives Canada. 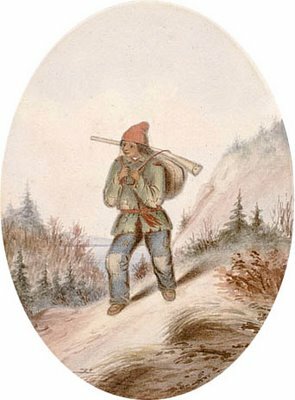 Coureur des Bois or ‘Habitant Hunter.’ Source, artist, date unknown. Following the Moose. Cornelius Krieghoff, 1860. Brooklyn Museum. Chasseur Indien/Indian Hunter. Cornelius Krieghoff. Musée national des beaux-arts du Québec. La Vérendrye at Lake of the Woods. Arthur Hider, 1900. National Archives of Canada. 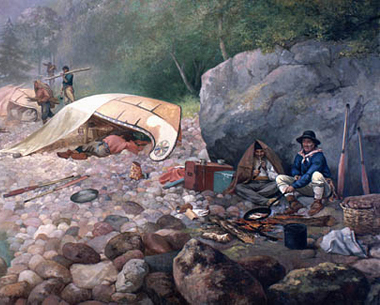 Canoe Manned by Voyageurs Passing a Waterfall. Frances Anne Hopkins, 1869. Library and Archives Canada. 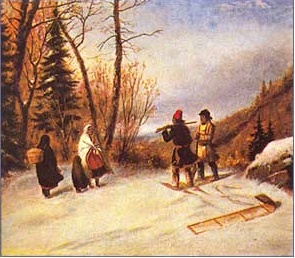 Indians in a Snowy Landscape. Cornelius Krieghoff, 1847-48. National Gallery of Canada. 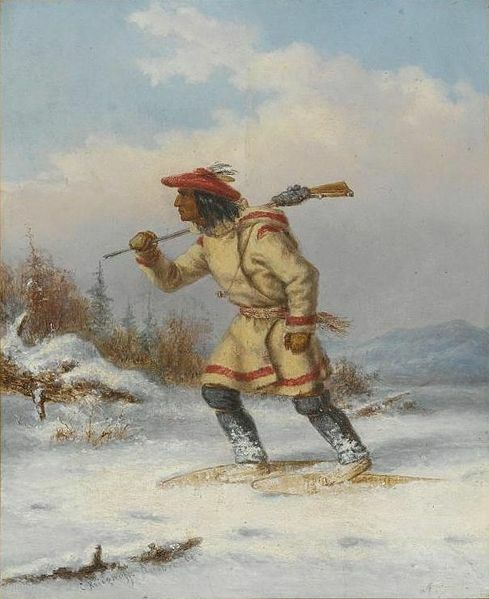 Indiens and Coureur des Bois, Cornelius Krieghoff, 19th Century. Location unknown. 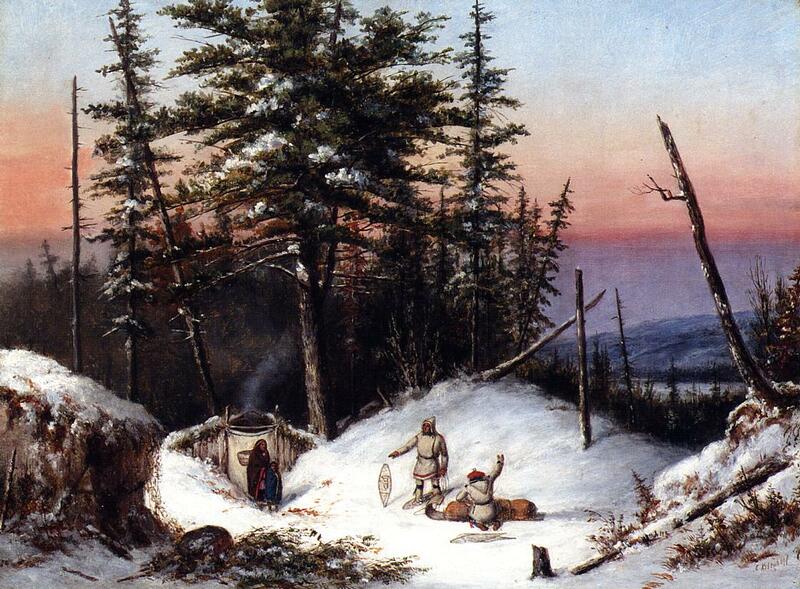 Trappers on the Frontier. Cornelius Krieghoff. Private Collection. 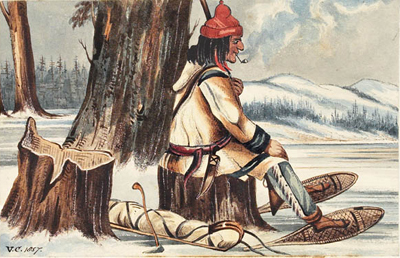 Voyageurs, trappers, hunters all come to resemble one another, and with good reason: they were all living in the same culture, working, living, and traveling together. In effect, what the images show is the emergence of a new culture, one that resulted from contact through trade and intermarriage between Europeans, Aboriginals, and Africans. 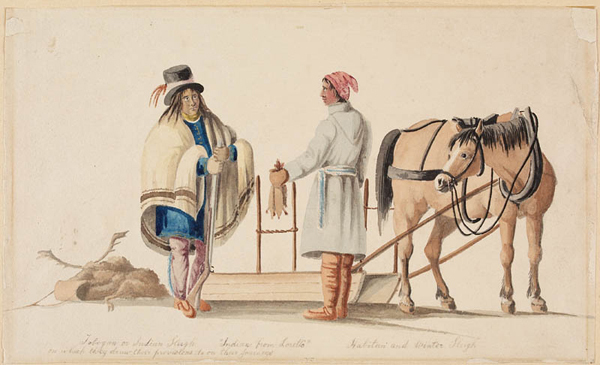 This metis culture, it could be argued, was nearly indistinguishable in its time and place from French Canadian or voyageur culture. Certainly this is true as it is reflected in the images I have selected. The only clear differentiation in the paintings is between the people who are representative of the ideal European and the non-European. 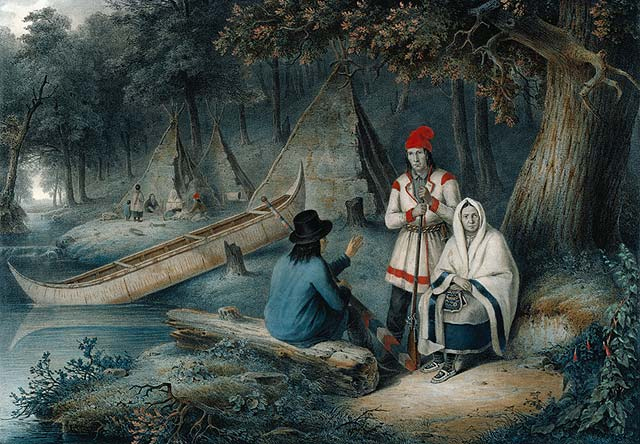 Thus, in Frances Anne Hopkins’ Passing a Waterfall you see the fur trade official and his wife (the artist) in the center of the canoe, formally dressed, being ferried through the wilds. 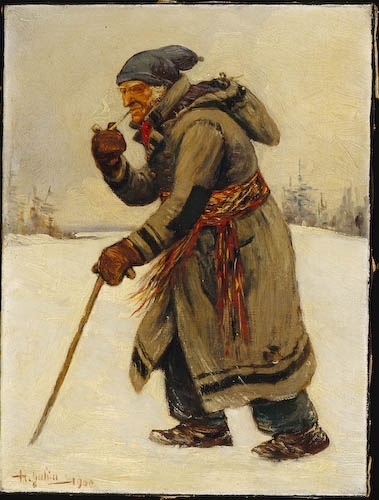 Similarly, in the portrait of La Vérendrye, the Quebec-born fur trader more closely resembles Hopkins’ bourgeois. 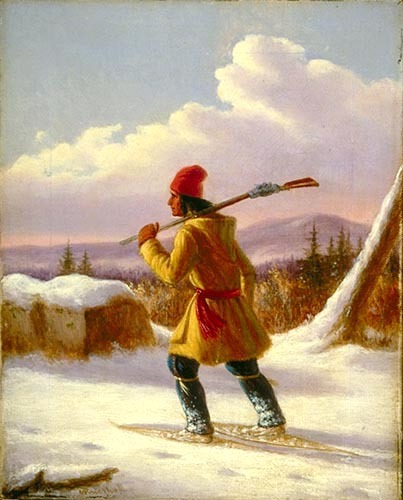 He is in fact known as an ideal – the archetypal voyageur, standing in stark contrast to the Indians and other French Canadians at his feet. Perhaps this is a reflection of the recurrent struggle, on the part of church and crown, to make civilized Europeans out of not just the Indians, but also of the French Canadians who in a generation or two became more native than French. Just as the manner of dress reflects the blurring of cultural boundaries, the interactions depicted tell another story. Among the French Canadians, Indians, and Metis, there is a sense of rapprochement – of people learning from and helping one another. Between the officials and the voyageurs, there is an entirely different engagement, based on the former’s authority over the latter. The final three images show a merging of the cultures into one way of life. In the eyes of the artists who encountered them, the cultural differences fade. The artists convey, with a sense of romanticism and an outsider’s perspective, the sense that there is a ‘distinction without a difference’ in the overall culture that developed in parts of New France from the earliest days of exploration. Click here for more information on metis culture. A good way to start a modern, uncertain, winter day–seeing how others made their way on the same earth (I especially like the voyagers at dawn–some sleeping in under their canoe shelter on the stoney beach). I am always amazed when I look at old paintings of winter scenes. There are paintings of London in the 19th century when the Thames froze over during what is considered a mini-Ice Age (due to a volcanic eruption.) So many survival skills lost, but I’m sure if faced with the prospect of severe winters without so many conveniences we would find a way to make do. This is a post I simply love. Thank you James.